フィリピンの子供達に皆さんが編んだブランケットを配布する様子のプレゼンテーションができて本当に楽しかったです！ It was fun showing the ladies today their hand knitted blankets that were given to the children in the Philippines! Today we took the time to just celebrate. To look back at all that has been achieved and be thankful for all that has been given. Teddy shared about the celebration of the season of Cherry Blossoms. Cherry blossoms in Japan are richly symbolic. Cherry blossoms symbolize the transience of life - extreme beauty and quick death. But we like to think of cherry blossoms as a reminder of new life, a new season with incredible beauty. 皆さん一緒に春の唄を歌いました。Here are some traditional Spring songs we sang together. And of course with any celebration comes good food! 今週はイースター。新しい命を祝う時です。It's also a time to celebrate Easter and the new life that it represents. And, we also celebrated the Philippines Project! Although delayed in sending the blankets, we plan to now send them in the first week of May. 80 young boys and girls in Leyte, Philippines who were affected by Typhoon Heiyan, will receive some love from Japan! We love creating and we love giving! We think that is worth celebrating. フィリピンプロジェクトのブランケット！写真撮影のため皆さん造った作品を探しました． Checking out all the blankets that have been created for the Philippines Project! Lots of celebration as the ladies searched for the creations so that we could get a group photo. このブランケットならきっとフィリピンの子供達を喜んでもらえるでしょう！ These blankets are definitely going to make some Filipino children very happy! More blankets for our Philippine Project came rolling in today! We've nearly hit our target of 78 blankets! Looking forward to seeing what comes in with tomorrow's class! 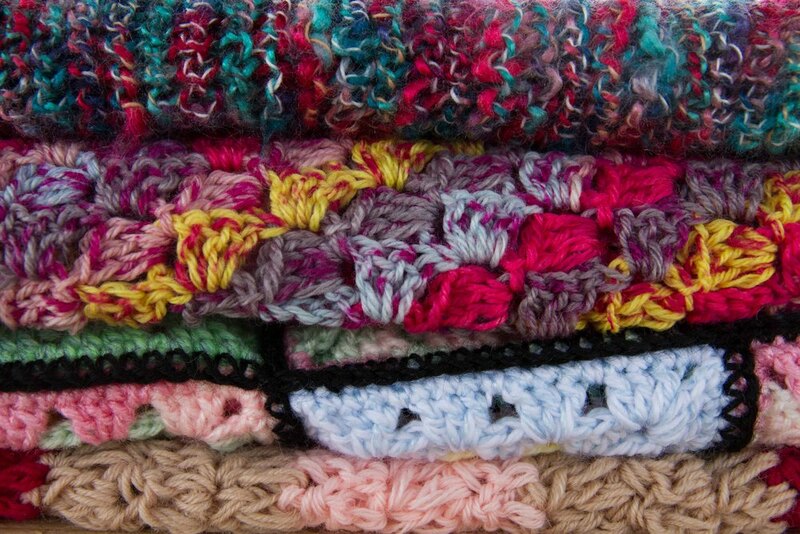 We are loving these blankets that the ladies have already completed for our Philippine Project! There was lots of clapping and close inspections as we admired one another's handiwork. Seikosan had enough yarn left over to make these adorable kid shawls!